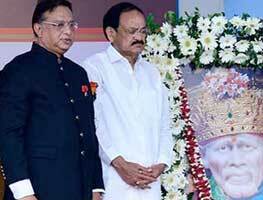 It was an honour for SAI International School to witness His Excellency Shri M Venkaiah Naidu,Hon’ble Vice President of India, as the Chief Guest in the SAI Decadal Celebrations on Monday, April 1, 2019. He delivered the SAI Decadal Lecture wherein the great orator enlightened the students, parents, teachers and staff of the school with his words of wisdom. He greeted the assemblage in Odia and wished everyone a happy Utkal Diwas. Hon’ble Vice President in his address congratulated SAI International School for being a role model laying emphasis on human development and universal happiness, whereby making it a distinguished school of the country. He added that the school is a glory for the entire country and India needs such educational institutions in every state and every district that will add culture and make better future citizens of the country. He advised both central and state management to encourage such uniqueness in other schools throughout the Nation. He highly appreciated SAI for inculcating values of culture and empathy in students and for its astounding success in every field. He said that as the Vice President of the Country my Best Wishes to the School Management for making the School a model worth emulating. In his address, the Hon’ble Vice President said that “good schooling which lays emphasis on overall development of the child without focusing solely on academic achievements is extremely crucial for youngsters to become responsible, caring and empathetic citizens of the country”. He added that education is not only for employment rather it is meant for the empowerment of an individual through knowledge and wisdom. Sharing about the ancient educational achievements of this great land, he said that “I expect you all to redeem our past structure” and align the education with the best pedagogies, teaching methods and techniques in the world, without losing the ethical moorings of the land, so as to become Vishwa Guru once again. He asked the students to give utmost respect to their teachers as no technology or Google can replace a Guru and it is only a Guru who can repair Google, if it goes haywire. He also inspired the students to have homemade staple diet instead of indulging in fast food as he said, “Instant food means constant disease”. His Excellency Prof. Ganeshi Lal, Governor of Odisha, the Guest of Honour for the SAI Decadal Celebrations, inspired the audience with his illuminating words. He advised the gathering to inculcate a positive attitude towards life by developing a habit of smiling and spreading happiness around. He also inspired everyone to enjoy the beauty of nature. In his welcome address, Dr. Bijaya Kumar Sahoo, Chairman, SAI International said that this historic day shall be forever etched in golden letters in the Institution. He outlined the significant improvement in the educational scenario of India in recent years both at national and state level. Citing ancient India’s glorious education system, Dr. Sahoo said that the country is witnessing a resurgence in the educational sector and Odisha with top institutions of national and international repute is all poised to become the 21<sup>st</sup> century educational hub. Students of Shri Harsha Memorial School for Deaf and Dumb and Sainik School were also part of the gathering. The dignitaries presented awards to four exceptional SAI Achievers of the academic session 2018-19. While Sameer Patro received the Stellar Achiever Award, the Prodigious Award was presented to Sibasis Nayak, the Global SAIoneer Award was presented to Pranav Manie and the Global Entrepreneur Award to Shivangi Sharma. Principal Shri Harish Sanduja thanked the revered dignitaries for their gracious presence and inspiring words. He said that the closure of the year-long SAI Decadal Celebrations will always remain a memorable one. Among others present on the occasion was Dr. Silpi Sahoo, Vice Chairperson, SAI International. The Decadal Celebrations of SAI International School commenced on April 1, 2018, commemorating its 10-year journey of excellence. The year gone by was marked with several events including lectures by eminent personalities, SAI Confluence on the theme ‘Dashak’, distribution of Decadal Pin among the students, release of Coffee Table Book encapsulating the achievements of the School and many other activities, events and festivities.